It's officially that time of year - the holiday season! I love a good party and especially a party that requires getting all dressed up! I realized I'm channeling a more minimalist vibe when planning this season's outfits - a little less glitter and a little more subtle sparkle. Like in today's outfit with the studded dress sleeves and silver pumps. 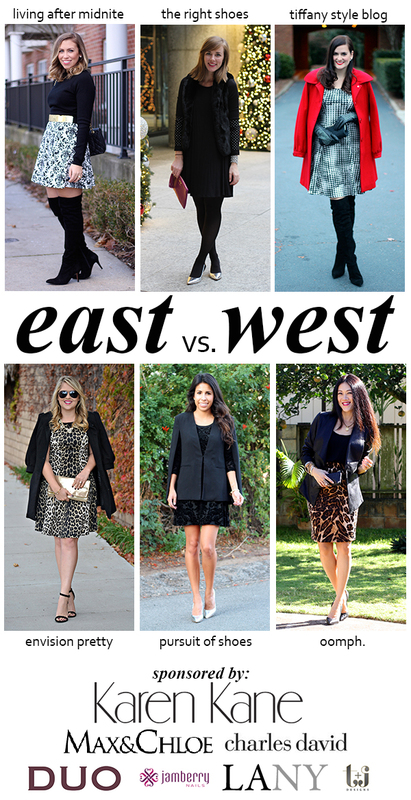 I hope you enjoy this latest installment of East vs. West - we're bringing you 4 holiday looks (and one is a little more casual! Stay tuned for that) over the next 4 weeks. I hope you'll check out everyone's posts below - can't wait to hear what you're wearing to your next holiday party! And can we talk about these tights for a second? They are absolutely amazing - they have a really thick waist band which helps them stay up all day and the color/weight is perfect! I haven't thought about buying Hanes tights in years and I'm so glad I was able to try these out this season! i link the subtle details here. love the second pic of you against the Christmas tree lights. Nice outfit, love the splash of colour from the purple bag and silver heels too.